How to use Starry Night to see meteor showers – Simulation Curriculum Corp. 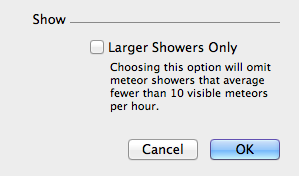 Early morning is the best time to view a meteor shower. Meteors will be visible to the naked eye as brief flashes of light streaking across the sky. All meteors in a shower will appear to be originating from a specific point in the sky, known as the radiant. 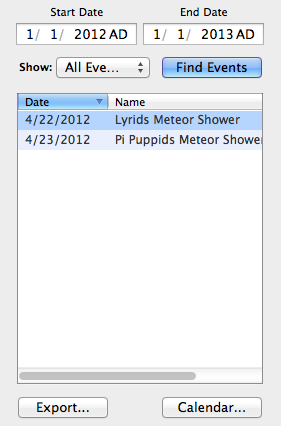 Meteor showers are named according to the constellation the radiant is in. The meteors of the Leonids meteor shower, for example, originate from the constellation Leo. 1. Update the Starry Night Data Files. There are two ways to do this. 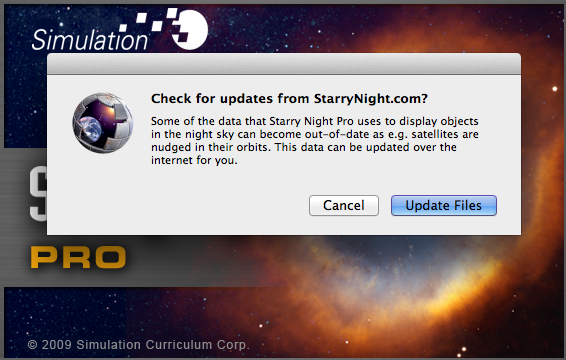 Method A: During the start up of Starry Night, you may be asked "Check for updates from Starry Night.com?" Click "Update Files" and proceed to step 2. Method B: Go to LiveSky ---> Update Data Files. Download the data updates, and then restart Starry Night and proceed to step 2. 2. Filter for Meteors in the Event Finder. 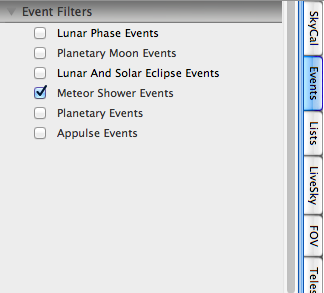 Go to Events (tab) ---> Events Filter ---> Select for meteor showers. 4. On the Events Filter Sub-Menu uncheck "Large Showers Only"
Click the Find Events button and the results will be seen. 6. 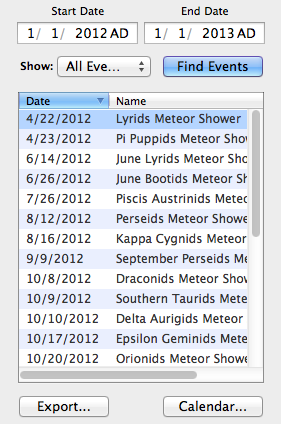 Right click on Lyrids Meteor Shower or any other and choose "View Event". Starry Night will locate the event in time and space. 7. See the NASA Lyrids skywatching video for further viewing tips. If it does not work please submit a ticket/reuest for assistance, and we'll see what we can do about fixing it.